What humeral IM nail is this? Does anyone know what humeral IM nail this is? This patient presented to my office the other day after having her humeral shaft fracture treated with this IM nail in the Ukraine. Limited ROM and shoulder pain. Not hard to figure out why. Re: What humeral IM nail is this? It's like a Medgal humeral nail. I think You will have no problems to remove screws ( standard cortical 6-border unscrew). To remowe the nail You have about 2 cm over capitus humeri. If it Medgal - the proximal carving is M10 x 1. 2 trauma depth, Lviv Emergency Hosp., Ukraine. 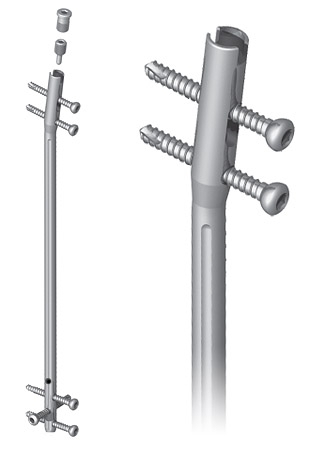 Proximal Screws Ø 4,5 mm, distal - Ø 3,5 mm.